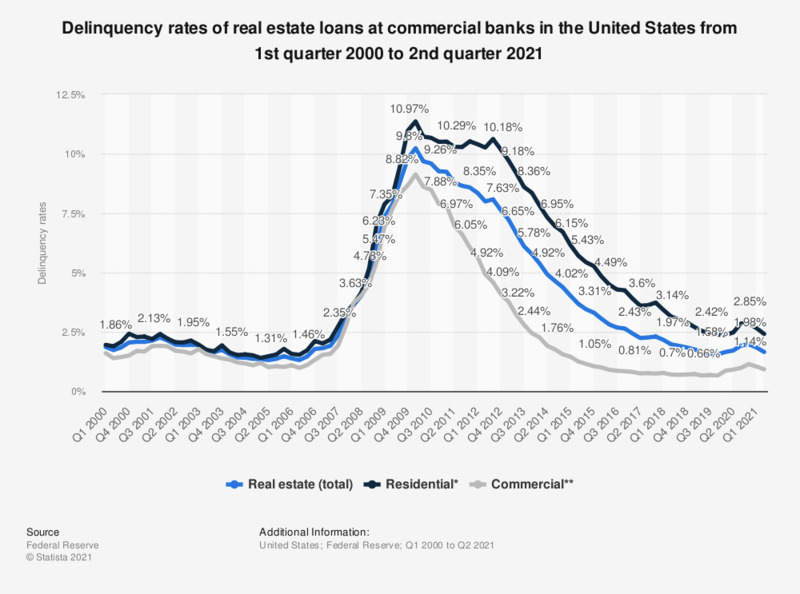 This statistic presents the delinquency rates on real estate loans at insured commercial banks in the United States from 2000 to 2017, providing a further breakdown of residential and commercial loans. In 2017, the delinquency rate on residential real estate loans at insured commercial banks in the United States stood at 3.71 percent. * Residential real estate loans include loans secured by one- to four-family properties, including home equity lines of credit, booked in domestic offices only. ** Commercial real estate loans include construction and land development loans, loans secured by multifamily residences, and loans secured by nonfarm, nonresidential real estate, booked in domestic offices, only. Annual averages of quarterly figures, not seasonally adjusted. Delinquent loans are those past due 30 days or more and still accruing interests as well as those in nonaccrual status. They are measured as percentages of end-of-period loans. If the monthly amount you currently spend on your mortgage was 100 GBP higher, which of these, if any, would you be most likely to cut back on?